May 18, 2015 May 23, 2016 • Glenna G.
I never expected a place like this to exist in Arizona… This water reminded me of New Zealand, although I’ve never before seen such spectacular waterfalls. 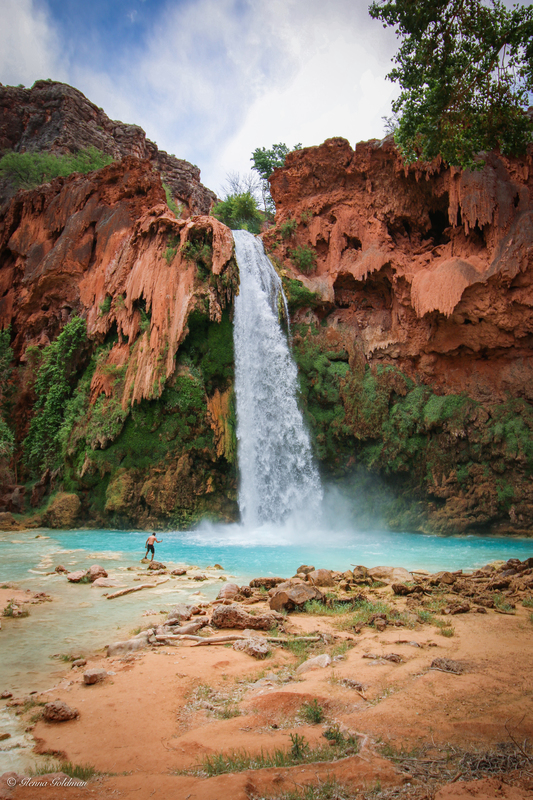 Havasupai means people of the blue-green waters. 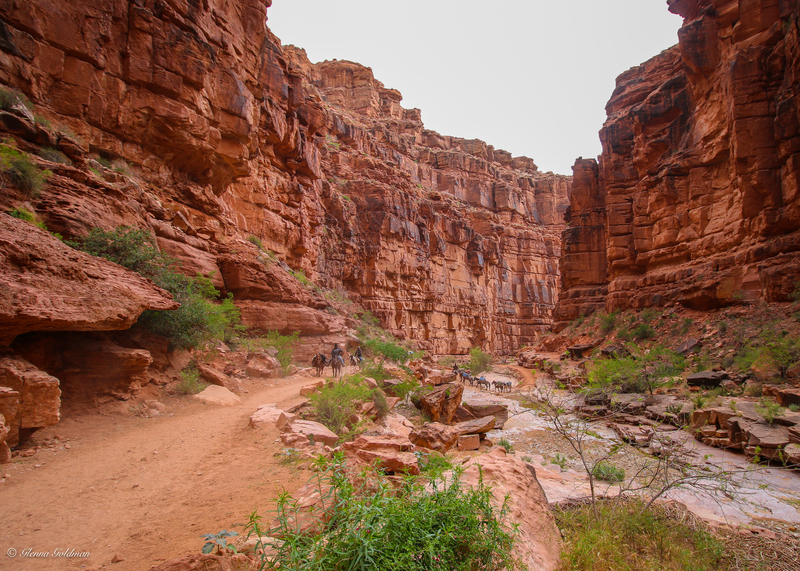 The canyon is on Native American land, so we needed special permits to hike and camp there. I’d been hearing about this hike ever since I moved to Arizona, and was lucky enough to get a chance to visit! Reservations are hard to come by. I heard someone at the campsite say they were booked till November, but we were able to squeeze in last-minute because of a cancellation. 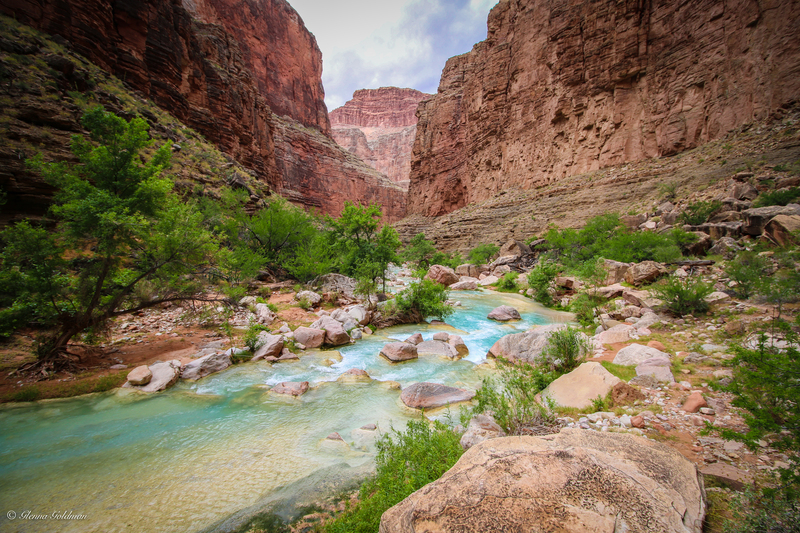 Jake and I made the 4 1/2 hour drive up to the Havasupai Reservation after work on Thursday. We car camped, since the parking log is on a cliff and there really isn’t a spot to put up a tent. We woke up bright and early the next morning, and made the steep descent down into the canyon. We hiked through a hot, dry wash for miles. We packed the whole way in, but most people just rent mules so they can bring camp chairs and coolers full of goodies. Some people even helicopter in most of the way… Glampers! 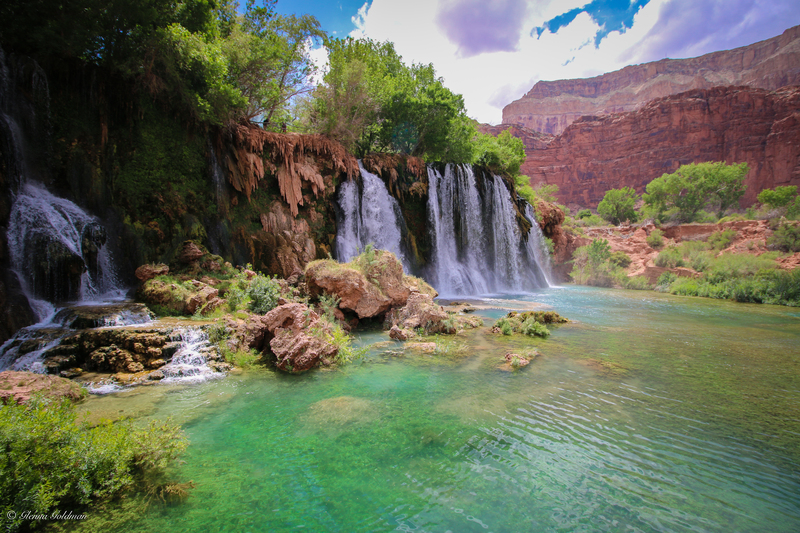 We completed our registration at Supai Village, and then came upon these wonders. Although it was cloudy for a large portion of our trip, we took the plunge and spent our 3 days cliff jumping and hiking out to the extensive network of falls. Navajo Falls was spectacular, and surrounded by pools formed by travertine deposits. 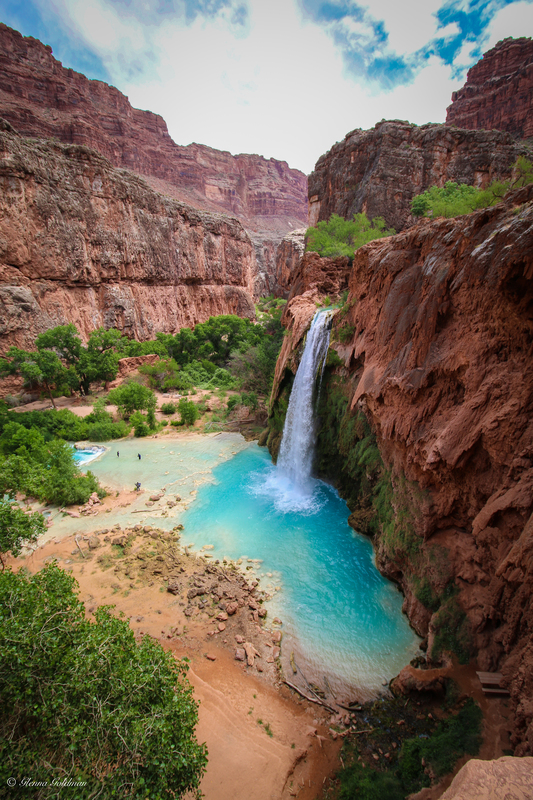 One of the most photographed waterfalls in the world, ninety-foot Havasu Falls greeted us just before we reached the campsite. 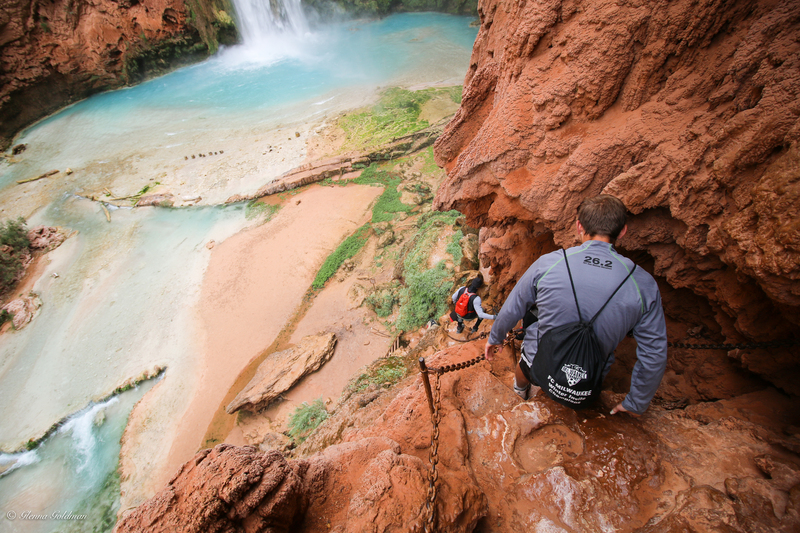 The long climb down to Mooney Falls, on a series of slippery ladders and chains. Hard to get the scale of it from photos, but it was huge! See those tents way up at the top? Twice as large as Havasu, stories say it was named after a miner who lost his life, falling deep into the travertine. 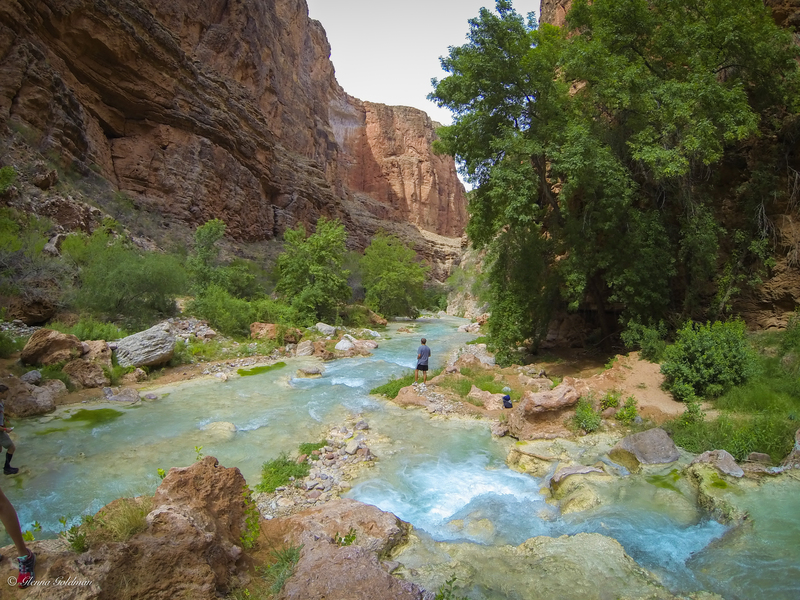 We met up with some other backpackers and hiked out to the confluence, where Havasu Canyon meets the Colorado River. We met some rafters taking a break. Apparently they’d been getting rained on for the past 5 days… Not ideal! After a long hike back to camp, we napped, ate some Mountain House, and played cards with some people who were also from Phoenix. They had a sweet setup of hammocks, strung up like bunk beds. We did some more cliff jumping the next morning, and then took the long hike back out of the canyon. The last bit was pretty tough, but we made it! Almost 40 miles in 3 days is no joke. Despite the weather being less than ideal, it was a fantastic weekend. Thanks so much to Jake for showing me such a spectacular place… And showing me the best spots to cliff jump! To read another account of the trip, check out The Traveling Geiger! A highlight video can be viewed HERE! This weekend I’m headed to San Francisco and Seattle. Time for some urban exploration! Posted in Hikes, Hiking/Backpacking Trips, Outdoors, Travel BlogTagged Hiking, Nature, TravelBookmark the permalink.